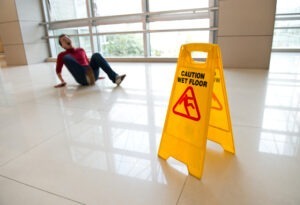 Slips, Trips & Falls – Have you suffered a slip, trip or fall resulting in personal injury? Slips, trips & falls are amongst the most common accidents in the UK, and are often followed by slips, trips and falls compensation claims. These unexpected accidents are usually caused by something simple and beyond the victim’s control, like an object left carelessly in a walkway, cracked or uneven paving, a missing manhole cover or a wet floor in a supermarket or shop. Speak to one of our friendly, experienced solicitors on 01925 937070 or complete our Slipping or Tripping Accident Personal Injury Accident Form by clicking here. Sometimes we can get up and walk away, probably laughing or embarrassed by people seeing us fall over, but there are situations where people are badly injured by tripping or falling over and that is no laughing matter. We can help you claim compensation for pain and suffering, as well as compensation for any earnings you may have lost as a result of being off work sick due to your injury. You may have damaged clothing or personal belongings due to your accident and we can help you to recover the cost. If it is recommended that you undergo rehabilitation such as physiotherapy we can arrange this for you and recover the cost. The expert personal injury lawyers at DSM Legal Solicitors regularly help the victims of slips, trips and falls claim financial compensation for their injuries. To find out if you could make a compensation claim, speak to one of our solicitors for a free, no obligation assessment of your personal injury claim. Why should I choose DSM Legal Solicitors for my accident claim? Our office in Warrington is minutes away from Junction 8 of the M62. We have free on-site car parking, and disabled access including a disabled lift and toilets. Please email info@dsmlegal.co.uk for an appointment. No Win, No Fee – no risk guarantee. If you lose your claim, you do not pay us a penny. Your accident claim will only be handled by a fully-qualified solicitor with the relevant experience. Slips, Trips & Falls: Can I Claim Compensation for my Personal Injury? If you have been injured in a slip, trip or fall that was not your fault, it is highly likely you will be able to claim financial compensation for your injuries. Common injuries which result from slips and trips can include sprained or broken ankles, severe back pain, broken bones, head injuries, concussion, knee injuries, cuts and bruises and more. Those responsible for public areas, such as local councils, shop and restaurant owners, have a legal duty of care to protect people from injury. All employers must also follow health and safety guidelines to prevent accidents, including tripping over wires or slipping on spills. Our office is in Warrington, Cheshire and we accept claims from across England and Wales. Call us on 01925 937070 to speak to a solicitor in confidence or click here to complete our Slip, Trip or Fall Accident Claim Enquiry Form. We can assist with personal injury (accident claims), road traffic accidents, medical negligence, criminal injury compensation claims, employment law claims, lasting powers of attorney, wills and probate, oaths, affidavits and statutory declarations, settlement agreements and professional negligence claims. Your slips, trips and falls compensation claim will be handled by a specialist personal injury solicitor, who will ensure that you receive maximum compensation. Over 95% of the cases we deal with are settled out of court. We GUARANTEE that we will always look after your best interests. We GUARANTEE that we will strive for the best possible outcome for you.